Need a go-to crafty audiobook series for when you have a REALLY big craft project ahead of you? With 19 books (and counting), and all of them available as audiobooks, Monica Ferris’ A Needlecraft Mystery cozy mystery series might be just what you’re looking for. 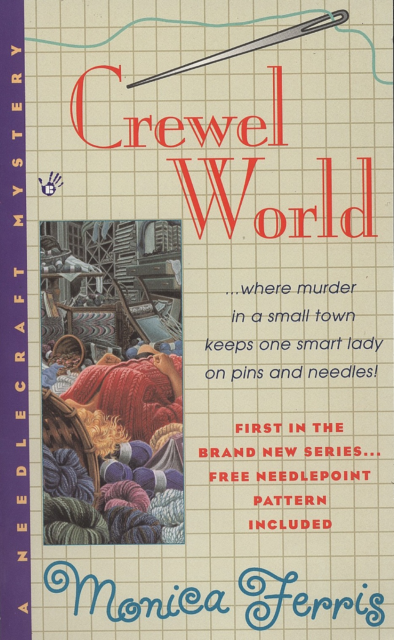 I’ve already read every single one of them, but they’re still some of my favorites, so I’m kicking off a summer re-read with a review of Crewel World: A Needlecraft Mystery, Book 1! Includes a beautiful embroidery pattern! As I mentioned earlier, I’ve already read all of the A Needlecraft Mystery books, so I’m not exactly approaching this reading of Crewel World with fresh eyes. But, I’ve enjoyed the Crewel World crew—that is, the people who work in or visit Betsy Devonshire’s newly-inherited needlework store—so much over the years, that this book was high on my to-review list. First off, as a whodunnit, the mystery was pretty well constructed, with at least three viable suspects. I thought I remembered who the murder was from my previous read, but I wasn’t completely sure until the end that there wouldn’t be a surprise twist that I’d forgotten. Beyond the mystery, I was reminded once again why I’m so fond of this series when the other characters turned out to actually be characters. Characters who had personalities, lives, and interests beyond being conveniently on hand to help the main character. (Imagine that!) I actually liked—and felt like I got to know—Betsy and her two main allies, Godwin and Jill, and I actively disliked the sexist cop, Mike Malloy, and Joe Mickels, her scheming landlord. Those feelings made the whole story more engaging. And speaking of crafting trends, I should note that, obviously knowing and respecting the audience most likely to read the book, crafting techniques were discussed often, and with familiarity.  When crafting happened to be going on in the background as the action unfolded, as it often was, it was described clearly and in detail, but without being annoying or dumbed down. It was plainly assumed that the author trusted the reader to have some basic knowledge, which was, frankly, kind of a relief, given how thoroughly many cozy mysteries fail when it comes to weaving crafting (or cooking, baking, etc.) into a plot. All of that said, this book is definitely a product of its time (it came out in 1999, so nearly 20 years ago) and of its author. It contains some things that I find to be problematic, like a bit of (probably) accidental racism, a whole heap of not-so-casual sexism (example: a male cop thinks a female cop needs a baby on her hip instead of a gun), an almost sweet amount of effort being put into trying *really* hard to be cool about gay people, and some ableism in the form of the “R” word. So, if any of those things might ruin your day or cause you pain, consider this your heads up. 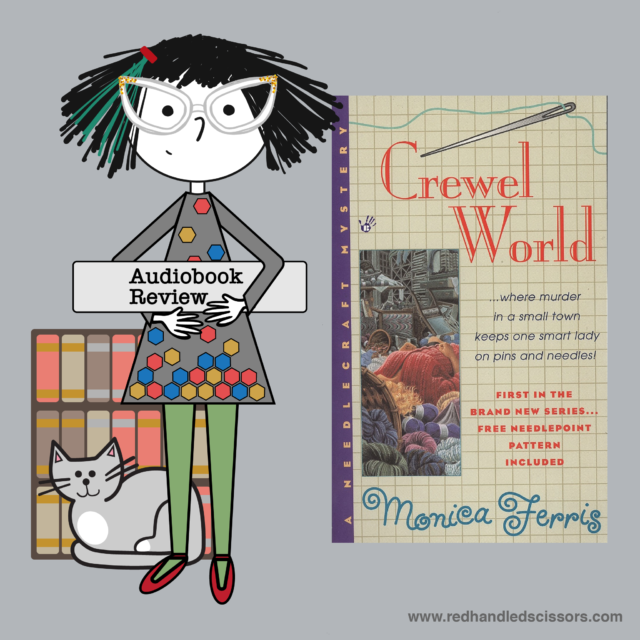 In the world of crafting-related cozy mysteries, Crewel World is a solid and enjoyable read. In fact, I’m so pleased about my latest trip back to my favorite fictional Midwestern needlecraft shop that I’ve already started listening to book 2. A mostly-related mini mystery (at least for me): I know the paper book promised a “beautiful embroidery pattern,” but, because I’m a lowly owner of only the audiobook, I have no idea what it looks like. If you happen to have a paper copy of the book kicking around, would you mind satisfying my curiosity by telling me what the pattern is? Edit: Oh, wait! Scratch that. If you scroll allllll the way down to the bottom of Monica Ferris’ site, you too can find a link to download a copy of the Tang Horse pattern that’s referenced in the book! Mystery solved! You can buy the book here: Crewel World Audible Audiobook (affiliate link), or request it at your local library!